About 42 percent of NKU’s total carbon footprint, or the amount of carbon dioxide and other carbon compounds emitted due to the consumption of fossil fuels is from transportation, according to University Planner Jane Goode. That’s a large amount compared to other universities, according to NKU President Geoffrey Mearns. The primary cause? NKU’s current commuter culture. But there are ways that NKU can combat those figures to help reduce its carbon footprint. Mearns and Goode alike see one of the biggest ways to do so as taking advantage of TANK. 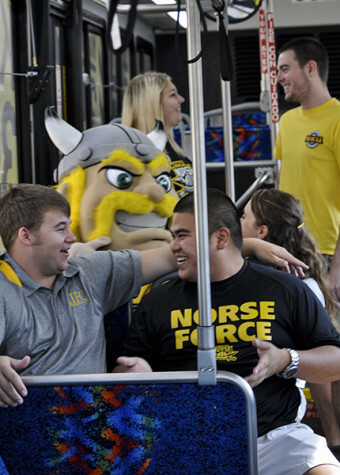 Victor E. Viking and NKU students taking route 35x. Mearns met with Andrew Aiello, the executive director of TANK, a month ago to speak about this issue. “I would very much like to have more public transportation options on our campus,” Mearns said. Currently NKU students get to ride TANK for free using their all cards through a program called U-Pass. TANK also operates the shuttle between Callahan and the main campus. And figures for TANK use by NKU students do seem to be on the rise. Recent initiatives such as instating an east-to-west TANK route (the 35X) could be a reason, according to Goode. Although both she and Mearns both hope the number of NKU students, faculty and staff who take advantage of TANK only continues to rise. 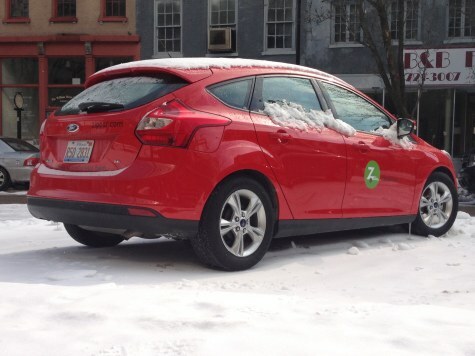 A Zipcar parked in nearby Downtown Cincinnati. The car is available for use as ridesharing transportation or as a back up for those who use public transportation. Car sharing, or “ridesharing,” is one option to help reduce the university’ carbon footprint (due to transportation) that has been looked at several times in the university’s past. NKU Student Government Association President John Jose worked on this issue in one of his very first projects as freshman senator. The liability issue Jose mentioned with the car share program could cost the university a lot of money, but that it could be something that the university continues to look toward in the future. Jose worked with other senators and Goode on creating this rideshare resolution for SGA. Goode said she would still like to see some sort of rideshare initiative in the works for NKU. One thing Goode thinks could help as a more limited version of car sharing is having a couple of Zipcars, which are cars placed in a location that may be rented by the hour or day, on campus. If people who take TANK or would take TANK had an emergency they could use those, Goode said, which could help increase the number of TANK users if nothing else. Jose said one other solution to the transportation issue could be the promotion of a more bike-friendly campus. “We [SGA] are working on getting a lot more bike racks and even maybe covered bike racks on campus,” he said. Jose hopes those efforts will help establish and promote a culture on campus where bike riding is a convenient option, therefore cutting back on the amount of students usign their car to get from close-by apartments or dorms. Mearns said he would be interested in hearing about ways to promote a more bike friendly culture on campus, but questioned the impact it could have based on the distance that many students, faculty, and staff all travel in order to get to NKU. Goode believes a bike culture would be something easy to create on campus.